Before embarking on the controversies and complexities of the classification of lymphomas, it is worth stressing the need for accurate diagnosis and the means of achieving this. In terms of clinical management, the distinction between reactive processes and malignant lymphomas and between lymphomas and carcinomas is of greater importance than the detailed sub-classification of lymphomas. 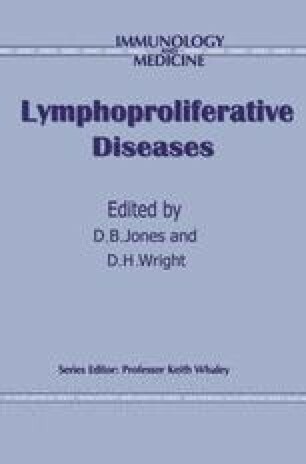 The histopathology of resected lymph nodes and other tissues remains the mainstay of lymphoma diagnosis, and the need for good fixation and high quality sections is paramount. The majority of pathologists rely on their standard haematoxylin and eosin (H&E) stain, but increasingly in Europe Giemsa is the stain of choice for the diagnosis of lymphoreticular disease. This technique certainly provides contrasts, and highlights features such as cytoplasmic basophilia that are not always apparent in H&E stained sections and it is worth using as an additional, if not as the primary, stain. In our laboratory the ‘lymph node set’ comprises H&E, Giemsa (methyl green pyronin may be substituted), reticulin (identifies basic architecture and reveals characteristic patterns of some lymphomas), periodic acid Schiff (reveals basement membranes, mucus in epithelial cells, IgM in some lymphomas).